This is actually a very tasteful love story (pun intended). The baker wanted to run away with his favorite waitress but the restaurant owner didn’t want them to elope because the wedding photos would make a fine story and bring a lot of attention to this obscure little restaurant whose name escapes us. 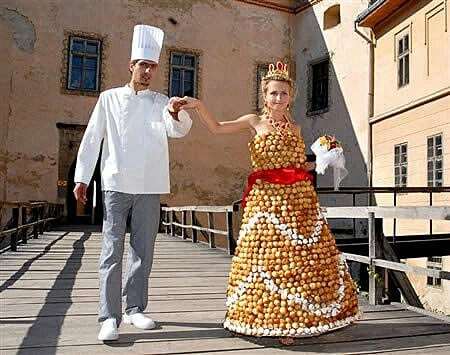 So the owner convinced the baker to create an edible dress for the “apple of his eye” and the baker’s wedding gown came to be. It’s a true work of art and love. Unfortunately, it’s not something that can be handed down to the next generation. This is a dress with an expiration date.